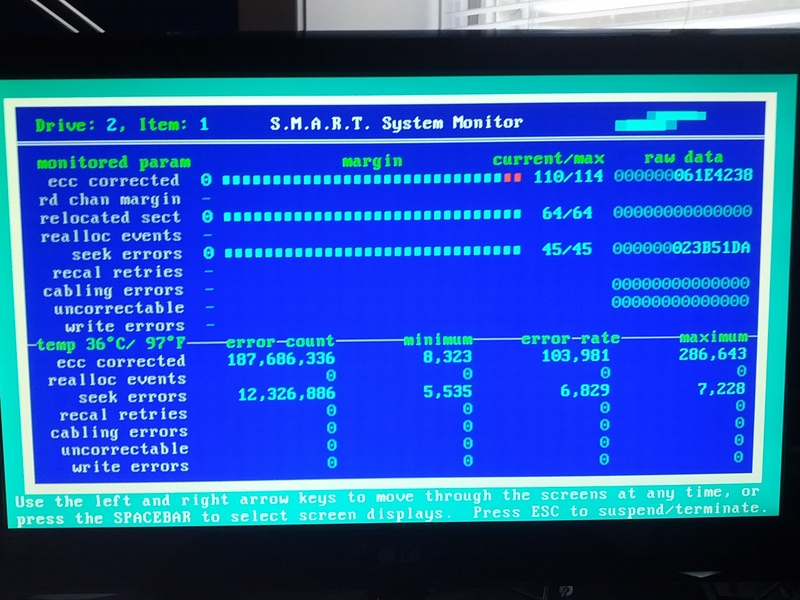 SpinRite's much smarter use of S.M.A.R.T. and the case for Preventive Maintenance. 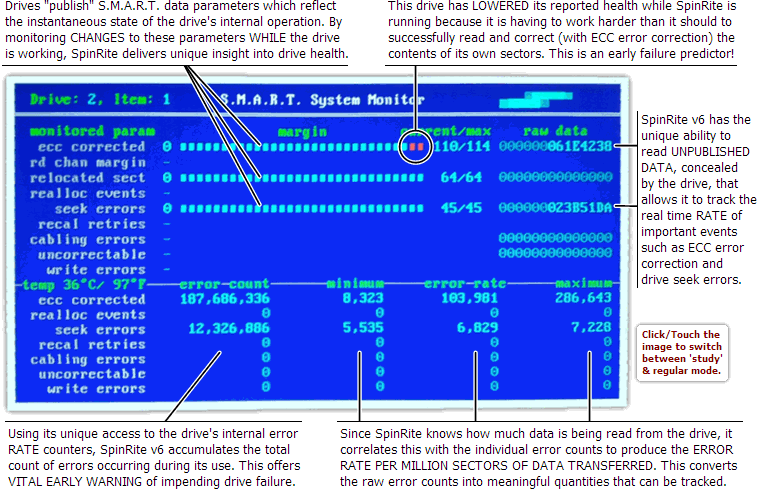 shows the power and value of SpinRite's S.M.A.R.T. System Monitor that this page was inspired. With the advent of IDE (Intelligent Drive Electronics) drives, the traditional hard drive controller was moved into the drive itself. This was a necessary evolution, since it freed drive manufacturers to innovate by giving them control over the drive's “low-level” formatting and allowing drive densities to explode as they have since the late 1980's. But this integration of the traditionally separate disk controller with the drive, meant that the drive was then managing its own condition internally and “autonomously.” In essence, it became a black box into which we pour data and then later hope that the drive will pour the same data back out. The trouble was . . . black boxes are black . . . meaning that we cannot see into them. In the case hard disk drives this meant that no one any longer knew how many defective sectors the drive contained, nor how many spare sectors were being consumed, or really what overall condition the drive might be in . . . because now the drive managed all of that internally. If all drives lasted forever this would have been a tremendous relief and not posed any problem. But the phrase “hard drive crash” is famous for a reason. We could easily make a perfect hard drive that never fails, but . . .
drives to operate near the edge of failure. with each other, and crammed to the limit with every last possible byte of storage. So a industry-wide S.M.A.R.T. standard was created to provide a means of asking this “black box” what was going on inside. data the drive makes available for our analysis. If you have not already done so, please study each of the “callouts” on the SpinRite S.M.A.R.T. System Monitor diagram above, then either click on that diagram or on the button below to switch to a detailed explanation of each display feature.